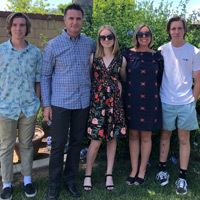 Alex and Mindy Moody have been Orange County residents raising their 3 children in Yorba Linda for many years. They have been in the construction industry for over 20 years focusing on the OC/LA market. The Moody's decided to branch out into the garage makeover industry and have really enjoyed the instant satisfaction that a garage makeover yields. They see the results of their efforts in days as opposed to months in other construction home improvement fields. GarageExperts of South Bay is your local garage makeover expert. View some of our recent work.